The nature of artistic creativity and its relationship with ‘difference' has intrigued people for centuries. The Genesis of Artistic Creativity is a revealing exploration of the lives of 21 famous writers, philosophers, musicians and painters including George Orwell, Wolfgang Amadeus Mozart, Andy Warhol and many others, in light of the recognized criteria for diagnosis of high-functioning autism and Asperger's Syndrome. Having diagnosed hundreds of individuals with Asperger's Syndrome during his professional career, Professor Fitzgerald examines here the social behaviour, language, humour, and obsessive interests and routines that accompanied creative genius in the past four centuries. From Herman Melville's eccentric breakfast habits and Simone Weil's intense dislike of being touched by other people to Ludwig van Beethoven's inappropriate marriage proposals and Vincent van Gogh's inability to form satisfying relationships with others, the author offers compelling insights into the association between creativity and autism spectrum disorders. >from *The Genesis of Artistic Creativity. Asperger's Syndrome and the Arts* by Michael Fitzgerald. 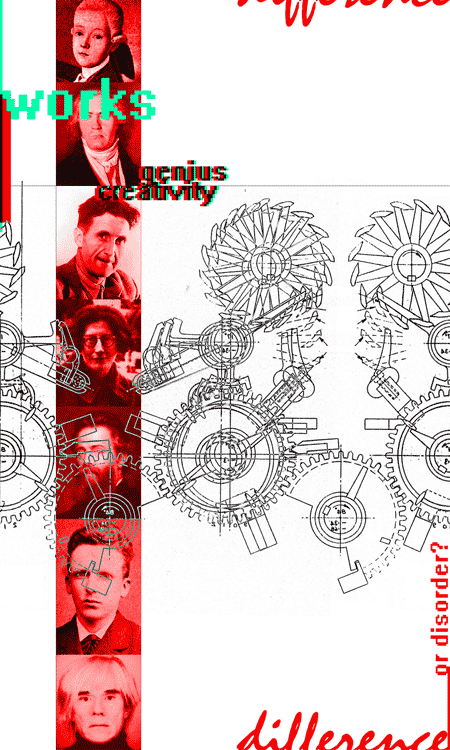 > genius creativity: difference or disorder?